I really, really REALLY enjoy celebrating the holidays with my family. Any excuse to spend more time or money on them is a good one! Valentine’s Day is no exception, but sometimes kids can get overloaded with candy, and I am not a HUGE fan of candy. It’s messy, no nutritive value, expensive and bad for the teeth. But, I know it is a fun part of childhood, so I let my kids indulge once in a while, and of course I enjoy some good, quality dark chocolate at times too! Since people will be giving my kids candy for Valentine’s day anyway, I would rather invest in non-candy gifts for them. Gifts that will last a little longer than an hour and that let them know I am thinking of them. If you’re a non-candy mom, this list will be perfect for you! Llama, Llama, I Love You book is perfect for Llama book fans! We love this series! Are you a fan of If You Give a Mouse a Cookie? If so, Happy Valentine’s Day, Mouse! is perfect for your family! Another super-sweet book for Valentine’s Day is The Day It Rained Hearts. Can you tell we love to read? What kid doesn’t love the rhythm and rhyme of Cat in the Hat? Hurray, It’s Valentine’s Day is perfect to add to your collection! Remember the big, lovable red dog? Clifford’s on a Valentine’s Day adventure in Clifford’s First Valentine. Elmo will not be left out of the celebration! Read about his Valentine’s Day adventures in Elmo, My Fuzzy Valentine. Got a little girl? She’ll look adorable in this Chevron Valentine’s Day Dress and Hairband. After all, you only get to be a little girl once! Add a small festive touch to your baby’s attire with this Cute Valentine’s Day Bib. And every baby needs a Valentine’s Day Onesies to lounge around in on February 14! My girls would squuuuueeeeeaaal is they got these Cutesy Valentine Stickers. As my daughters grow older, they are wanting more grown-up jewelry. This Heart Necklace seems like the perfect choice for their ages! Stuffed animals are a must on Valentine’s Day! Love this Plush CUrios George who’s holding a HUGE red heart! I have a thing for stuffed giraffes. They are just super-cute. This Valentine’s Day Giraffe is no exception to giraffe cuteness! Add some giggles and fun on Valentine’s day with these Heart Bopper Headbands. Valentine’s Day is the perfect time to try out new crafts! Love this Foam Butterfly Heart Craft Kids that comes with all the supplies you need! Easy-peasy! What kid doesn’t love to wear sunglasses? Snag some Heart-shaped Sunglasses for Valentine’s Day! In the evening, curl up with your kiddos and watch Be My Valentine, Charlie Brown. Kids love chapstick? These Heart decorated chapstick holders will be a fun surprise! What cute gifts do you plan to give your kiddos this year? 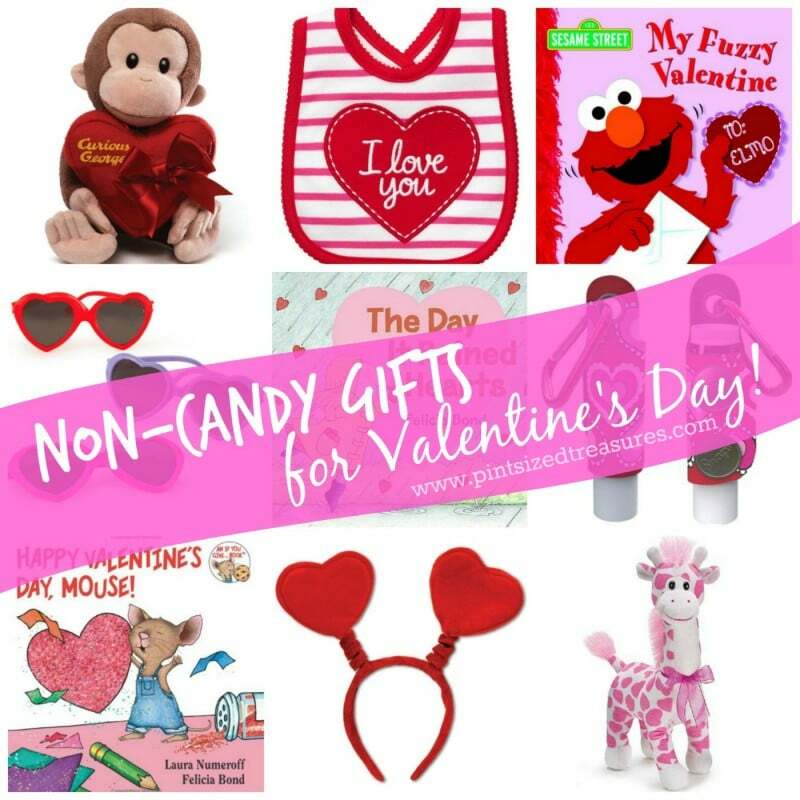 Are you going with traditional Valentines and candy or trying something new! Connect with us on social media to let us know!